Rare, heavily figured walnut cocktail cabinet, beautuful original art deco! 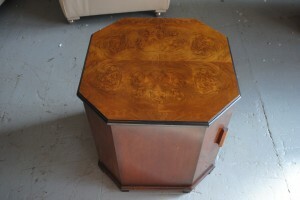 A stunning original art deco cocktail cabinet with heavily figured walnut veneer. 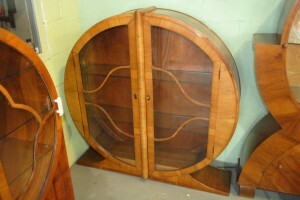 This is a very unusual and rare shape with demi-lune centre and two beautifully curved sides. The fluted doors open at the top to reveal a lovely satin wood and mirrored interior. In the middle it has a mirrored pull out mixing tray sitting just above the bottom centre cupboard which has a bottle rack and handy shelf. The other two cupboards are great for additional storage and have the same satin wood finish. This is a wonderful and imposing original art deco piece. For more details please call 01257 473688. 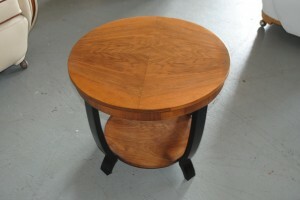 An original art deco Epstein nest of tables with lovey book matched quartered walnut veneer. Its always great to have these original commissioned pieces as they are always a little different from the last. This lovely petal shaped nest has protective glass to the main table and also the 4 under tables which mirror the same shape. For more details please call 01257 473688. An original art deco cocktail cabinet in lovely figured walnut veneer with satin wood and mirrored/glass interior to the top. It has an internal light activated with the opening of the doors which can also hold glasses. Sitting in the middle is the mirrored pull out mixing tray which adds to the beauty of this piece. At the bottom there are two drawers, shelves and bottle holder so great for storage. For more details please call 01257 473688. 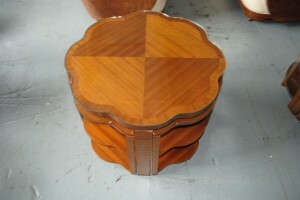 An original art deco coffee table with book matched veneer circular top and under tier in great condition. For more details please call 01257 473688. 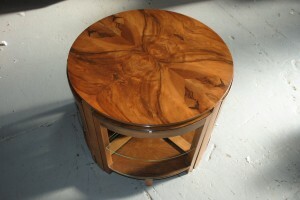 Original Art Deco Drinks/Book Table, a rare and very unusual 1930s piece. Fantastic! 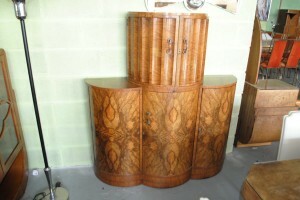 A very quirky and rare art deco cabinet that has been cleverly designed with a wow factor! The table opens at both sides to reveal glass and bottle holders, perfect for setting the 1930s scene in your own home whilst enjoying a drink or two! 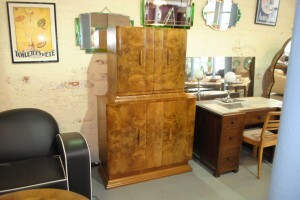 Lovely walnut and maple veneer in great condition. 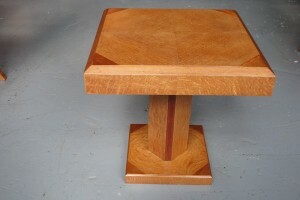 People love these as book tables but with all of the added detail what more could you ask for! 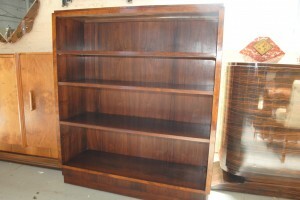 An original art deco walnut and rosewood bookcase with three adjustable shelves. In very nice original condition. For more details please call 01257 473688. An original art deco iconic walnut rocket cabinet in very good original condition with glass doors, shelves and Bakelite handles. 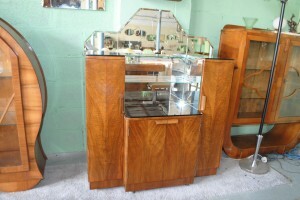 An original art deco walnut cocktail bar with a beautiful cut glass shaped mirrored back and Mirrored black glass tops. The top centre glass shelf has a soft warm light underneath adding a nice touch to cocktail preparations. Similarly the bottom centre cupboard has a light so that you can select the right bottles!. The two side doors open to reveal additional shelves, handy for holding the glasses. An original art deco Walnut gaming nest of tables, the 4 under tiers have holders that swing out when in use and one quarter has a felt lined lift up top for storing pieces. This is a very nice, quirky piece. 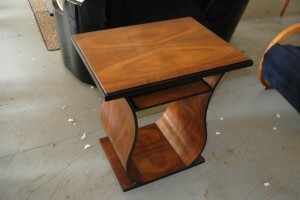 An original art deco figured walnut console table with beautiful veneers and stunning shape. This is in very nice original condition. An original art deco coffee table with very nice oak veneer detail with a pedestal column which is unusually positioned on the base, adding a rare dimension to this table.